How Green Can a Planet in a Resonant Orbit Be? When looking for exoplanetary homes for life, planets around M-type stars show a lot of potential. Although these dwarf stars are smaller and less luminous than our sun, their lifespans are much longer. A dimmer star means that the potential habitable zone (HZ) is much closer in to the star. Whereas Earth orbits 1 AU (roughly 93 million miles) from the sun, the HZ around an M-dwarf is anywhere from one tenth to even a few hundredths of that distance. Planets this close to their stars have shorter orbital periods, making them easier to find by our current planet-hunting methods. Planets so close to their stars are more likely to fall into orbital resonances with their star. In its most extreme case, this means tidal locking, where the planet makes one rotation per orbit, as the moon does around the Earth, resulting in permanent day and night hemispheres on the planet. This leads to extreme heat and cold, although there has been research indicating that heat transfer through the atmosphere and a greenhouse-friendly atmosphere could make tidally locked planets less hostile to the possibility of life. A less extreme example is a 3:2 resonance, where the planet makes three rotations for every two orbits. (Click through for a helpful .gif.) Mercury is in a 3:2 rotation around the sun. Each Mercury year consists of one and a half Mercury days. Mercury, of course, lacks an atmosphere and has a temperature range from 100 – 700 C, so it’s not exactly hospitable. A 3:2 planet around an M star, though, would not be so intensely hot. Temperature isn’t the only criterion for habitability. Starlight brings more than heat – at least on Earth, the sun’s energy also provides the basis for the food chain, via photosynthesis. Although photosynthesis isn’t necessarily a requirement for life on a planet, it is essential to the biosphere of Earth. This paper investigates the possibility for photosynthetic life to exist on a planet in a 3:2 orbital resonance, where long days are paired with long nights that could starve photosynthetic life out of existence. First, the authors calculate the flux received over the surface of the planet. On Earth, flux varies by latitude, but works out evenly at a given longitude – the equator gets the same amount of energy from the sun in Quito as in Jakarta. But if a 3:2 planet’s orbit is eccentric – Mercury’s is 0.206; high eccentricity may what keeps a close-orbit planet from becoming tidally locked and at 3:2 instead – things start to get weird. If the eccentricity is above 0.191, the star will have apparent retrograde motion across the sky. At some longitudes, this even means that the sun will rise a bit from where it has set before reversing to set once again (see figure 1). Figure 1: The position of the star in the sky over 2 orbits, at longitudes along the equator. On the left, with eccentricty of e=0, the star moves straight across the sky, as on Earth. On the right, for e=0.3, the star exhibits retrograde motion. For longitude of 90 degrees (yellow), the dips above and below the line where the angle of the star is 90 or -90 degrees indicate the sun rising from where it has set, or setting back from where it has just risen. Figure 2: Integrated energy received over 2 orbits as a function of longitude (x-axis) and latitude (y-axis). Red means more flux, blue and black mean less. 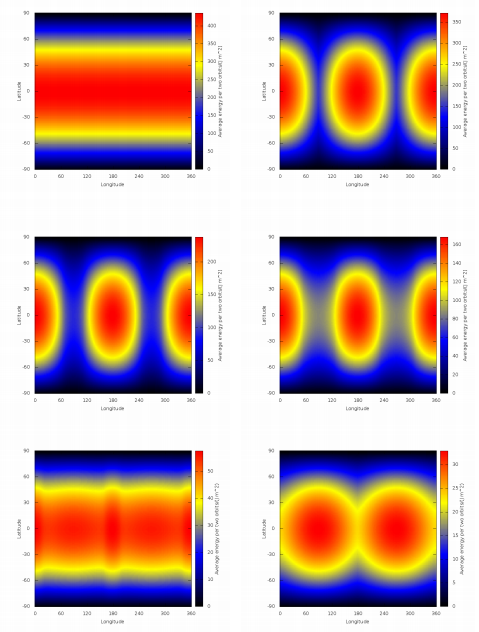 From left to right, top to bottom, at eccentricities of e=0, e=0.2, e=0.4, e=0.5, e=0.7, e=0.8. This retrograde motion means that different longitudes will receive different amounts of stellar energy over the course of the two-orbit cycle. Figure 2 shows the stellar energy received over two orbits as a function of longitude and latitude. In the upper left-hand image, with zero eccentricity, all longitudes are the same, with the most flux in the two bright bands. But once eccentricity is up to .2 (upper right), some longitudes receive much more energy than others, as seen in the bright and dark areas. The longitudinal variations in the light cycles make habitability – on local and planetary levels – a complicated question. The average stellar flux would be enough for photosynthetic life, but organisms can’t bask in a two-orbit average. They would be subject to dramatic local variations, long nights, constrained habitats, as well as planet-wide results of the 3:2 orbit including the risk of planetary freeze-out. 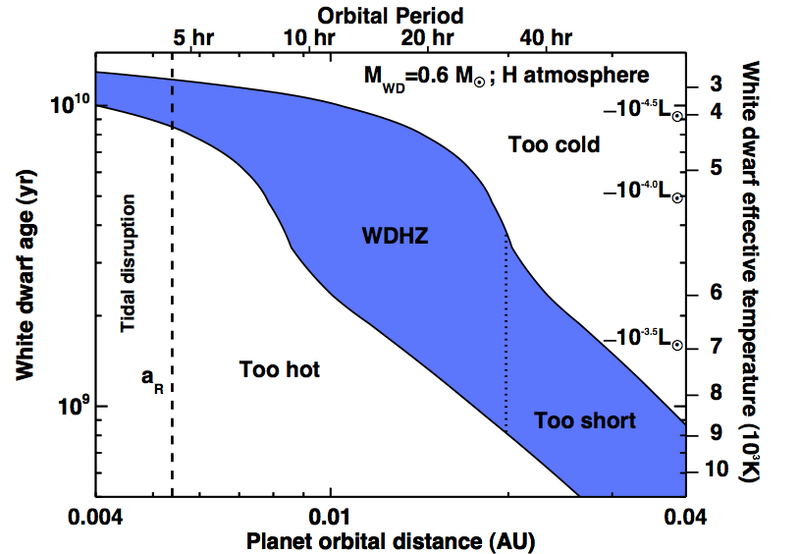 The authors use the research already conducted into potential conditions on fully tidally locked planets (in a 1:1 resonance) to extrapolate to the similar but less-extreme 3:2 planet. A tidally locked planet has a risk of the runway freeze-out of its dark-side atmosphere, although atmospheric heat transfer to the dark side could allay this event. Although the darkness on a 3:2 planet is not permanent but simply long, the authors argue that while freeze-out is a possibility, it is an unlikely one. Even if long nights don’t cause a planet’s atmosphere to freeze, prolonged darkness is still a major challenge for organisms that get their energy from light. In the cross-disciplinary spirit of astrobiology, the authors collect extensive research from biology that provides examples of photosynthetic life surviving extended darknesses through two methods: dormancy and mixotrophy. Many phytoplankton, dinoflagellates, and diatoms have been shown to survive without light for months, years, and even decades. And some green algae are mixotrophic, subsisting on photosynthesis when light is abundant, and switching to digestion by way of phagotrophy when it is not. These examples show the wide-ranging flexibility of photosynthetic life. The precedent for the adaptations needed to flourish in the weird light conditions of a 3:2 planet is certainly there. What isn’t certain, of course, is everything else. The authors make an especially interesting point about one of their necessary simplifications, this one in terms of orbital dynamics. This paper’s calculations of a planet’s orbit use fixed Keplerian parameters, but from Mercury (our own local 3:2 planet) we know that its perihelion actually precesses, meaning it shifts gradually over time. As perihelion precesses, the zones of high and low flux (figure 2) shift over the planet’s surface. A colony of photosynthesizers living in a bright zone could find themselves losing the extra daylight they depend on. The authors posit, though that since precession takes place on the same general timescales as evolution, precession could drive adaptation and speciation rather than extinction. While a planet in a 3:2 orbital resonance could be home to photosynthetic life, its biosphere would show very different patterns than ours. Rather than latitudinal bands of climate, a 3:2 planet would have biomes constrained to certain longitudes. As we get closer and closer to the ability to scan exoplanets’ spectra and atmospheres for signs of life, the familiar biosignature of photosynthesis – oxygen waste – remains a promising clue. I am an MFA candidate in Creative Nonfiction at Columbia University. I focus on science writing, particularly astronomy and astrobiology. I am also a member of Neuwrite, a collaborative working group for scientists and writers. I host The Catapult, a podcast of new writing. Should read “Planets this close to their stars”. I love your blog, though!